Born on 12 July 1920 in Whitehorse, Yukon Territory, he lived in Dawson City as a youngster and saw the Klondike gold fields. He attended Victoria College and the University of British Columbia. He served with the Canadian army for four years. Mr. Berton began his newspaper career in Vancouver, became city editor of the News Herald and a feature writer with the Sun before moving to Toronto. There he became an associate editor of the Toronto Star and of Macleans magazine. He is an author of distinction having written over 40 books. His work also includes stage, radio, television, and film scripts. He received three Governor-General's Awards for non-fiction and two national newspaper awards, the Stephen Leacock Medal for Humour, and was also the recipient of the Order of Canada. He was well known as a radio and television personality; had his own television program and was a member of the panel on "Front Page Challenge". He was an original member of the Board of Governors of Heritage Canada. In 1985, he was inducted into the Manitoba Order of the Buffalo Hunt. 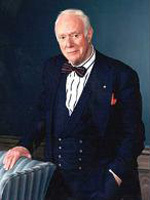 Pierre Berton died on 30 November 2004, at the age of 84, beloved by generations of Canadians.